I am too young and too rich. What am I doing here? His name is Raheem, his age is twenty, his ancestry is Jamaican and he now wants to earn £200,000 per week. “I don’t want to be perceived as a money-grabbing 20-year-old. I just want to be seen as the kid who loves to play football and wants to do the best for the team.”, said the lad, upon refusing The Reds’ proposal to double his wages with a £70,000 offer, then reportedly rejecting an improved £100,000 deal and finally turning down a £130,000 contract just few days ago. Yes, he and his agent, Rob Segel want more. They want a pile of cash big enough to promote Sterling into a Premier League’s top ten earners’ list. To put it into perspective: they want roughly the same amount of money as the mini-fortunes which are being transferred to Mesut Özil’s, Eden Hazard’s or Diego Costa’s bank accounts these days. “If Liverpool had offered me a contract last summer I wouldn’t be rejecting £100,000 a week now” adds the player, clearly stating what he would’ve if the club could’ve… before talking to press some more: “It’s not about the money at all. It’s never been about money. I talk about winning trophies throughout my career. That’s all I talk about.” Meanwhile, the talks keep going on as Liverpool drifts further and further away from the Champions League football next season. 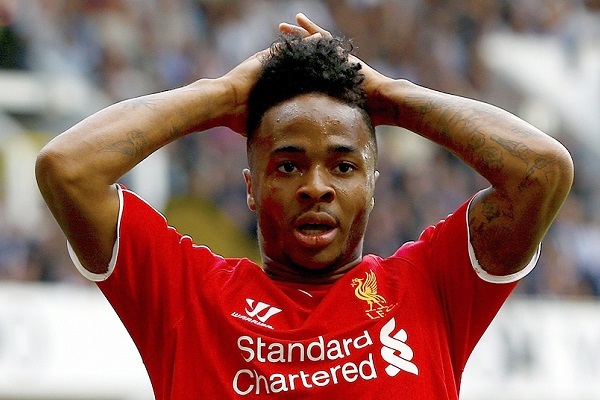 Let’s face it: Sterling has very little hope to win trophies by staying on Anfield. As I’m typing these words, it’s been 3 years, 34 days, 17 hours and 24 minutes since The Reds’ last success – and that was only a minor one, scored in Carling Cup against Championship side Cardiff City. The investments last summer were only a moderate compensation for the loss of Luis Suárez: out of eight new signings, only Emre Can and Alberto Moreno have put enough of convincing, first-team appearances to justify their transfers. Just as the players, the tactics keep being hit-and-miss too. Dealing with blatantly obvious imbalance between teams’ defensive and offensive capabilities, Brendan Rodgers prefers to play an all-out attacking football, regularly choosing a 3-4-3 formation – a strategy that works well against lesser teams just as often as it fails against direct rivals for European cup competition spots. Aside from that, Steven Gerrard will be leaving his beloved club soon, creating a gap in team’s midfield. We’ve all seen Jordan Henderson recently stepping up and providing quality of a decent CM apprentice, but what about the leadership in a dressing room? Also, who’s going to score goals for the team if Daniel Sturridge goes on an another trail of tears and injuries, as he usually does? Sure, those are the problems; on the other hand, there’s the money. For all we know LFC might offer Sterling a lot. The ball is on club’s side of the net – and it’s executives need to consider how Wayne Rooney’s case unfolded. Fourteen months ago, Manchester United player was widely criticized for his greed, as he went into a prolonged conflict with Red Devils only to get rewarded with an insane £300,000-per-week deal. It was obscene, unnecessary and aimed only at not let Wayne leave for Chelsea – claimed many. Fast forward to 2015, Rooney easily remains the best outfield player in MU squad. At the same time, the other “stars” in Louis van Gaal’s team – Ángel Di María, Robin van Persie and Radamel Falcao – all keep slumping despite receiving earning just a tad more modest figures than Rooney’s. Sterling, nine years younger than his Everton-raised colleague, will probably never become as good goalscorer as Wazza is, but there are still long-term prospects of improvement ahead of him. Of course The Reds are not nearly as wealthy as United – but if we look at the leaked wage bill, with £140,000 soon to be freed up by Gerrard’s departure and around £100,000 collected by “aces” like Johnson and Balotelli, Sterling’s demands don’t seem so ridiculous anymore. Does it mean that he actually deserves such salary, though? Well, let’s take a look by comparing the lad with players he aspires to join in a multimillionaire club. This season, Eden Hazard played 3325 minutes of football so far, scoring 16 goals and 8 assists with roughly 2 shots and 2.5 key passes per game as well as the average pass success of 86%. Compared to him, Sterling’s 3020 minutes, 7 goals, 8 assists, 2.3 shots, 1.9 key passes per game and 80% pass success look clearly inferior. On the other hand, Liverpool winger has scored and assisted more times than Özil did. But if we consider the fact that Gunners’ playmaker needed only 1485 minutes on the pitch to score 4 goals and provide 6 assists – again, Sterling’s stats don’t seem so good anymore. The closest match to Raheem’s performance right now is probably Swansea’s Gylfi Sigurðsson and his 5 goals, 8 assists, 2083 minutes this season. Curiously, the Icelandic midfielder was Liverpool’s transfer target back in 2012, when Brendan Rodgers refused to offer him better wages than he got at his current club. As a result, in Wales, Gylfi recieves roughly £50,000 per week. If there is any justice in this world, Sterling should not aim for anything above it. To sell? Or not to sell? That is the tension. Of course the world is not based on ‘justice’. One of the key factors in this contract / transfer saga is Queens Park Rangers’ deal made with Liverpool when the man in question used to be a little boy and just moved from London to Merseyside. QPR insisted that 25% of Sterling’s future fee should go to The Hoops if their ex-youngster ever decides to switch clubs again. Considering that teams like Real Madrid, Manchester City or Bayern Munich are all fully capable of bidding £60 million this summer, Rangers might severely cut Liverpool’s profit from such sale, earning up to £15 million for themselves – more than they’ve gained from any straight-up player sale in 2014; more than Chelsea gave them for full-time services of Loïc Rémy. The math is simple: this hypothetical £15 million cut is enough to support Sterling’s most recent wage demands for nearly a year and a half. Considering that the actual transfer fee paid to QPR by Reds was just £0.5 million, keeping the player with number 31 on his shirt may as well turn out to be a better choice, especially if he himself uses that 1.5 year to boost his market value even more. That can happen; after all, LFC’s quality upfront heavily depends on his form. Oh yes – the form. The form is fluctuating this season. Just like the entire Liverpool team, Sterling did well against the likes of WBA, Burnley, Bournemouth, Swansea, West Ham, Southampton and, most recently, Manchester City. But Liverpool had also several more demanding opponents this season. Faced against Real Madrid, Manchester United and Chelsea, ‘the kid who loves to play football’ scored only 1 goal in 6 games – games that should’ve determined how worthy he is of a huge raise or a huge transfer. Rationally speaking, he never did prove to be good enough. But as it’s been said before, football market remains hugely irrational ever since Jean-Marc Bosman, an obscure Belgian, demanded a free move to another club once his contract with FC Liège expired. Since the 90’s, player wages skyrocketed – and recently, so did the funds available for top football clubs. It’s ridiculous, but true: City, Chelsea, PSG or Real could easily burn £60 million on Sterling and live with it even if he turns out to be a flop. They could spend big money and wait four-five years for the man to start paying off. But they also have Jesús Navas, Willian, Lucas and Gareth Bale already. Apart from the Spaniard, those players are all better footballers than Sterling is today. Another name under the radar to reckon with is Jordon Ibe. Though not nearly as famous as the four mentioned above, he is the latest inclusion in Liverpool team and has already made few impressive appearances for Reds, such as two key games against Besiktas in Europa League and a six-pointer EPL clash with Tottenham. Ibe is one year younger, six centimetres taller and twelve kilos heavier than Sterling, and he certainly shows good potential after returning from loan to Derby County. For a group of outraged LFC supporters, who see Sterling’s contract discussions as insulting, Ibe is a ready replacement for the job – after all, he’s a right-footed, imaginative winger too. From such viewpoint, “Life After Sterling” seems plausible: next season, Ibe would gain more experience by switching playtime with Adam Lallana, who’s been severely underused in 2014-15 campaign. It looks good on paper. However, in reality, Ibe has to yet score a goal and provide his first assist in red shirt, while Lallana is half of a player he used to be in Southampton. If these two were forced to take care of Liverpool’s creativity, problems would occur sooner than later. 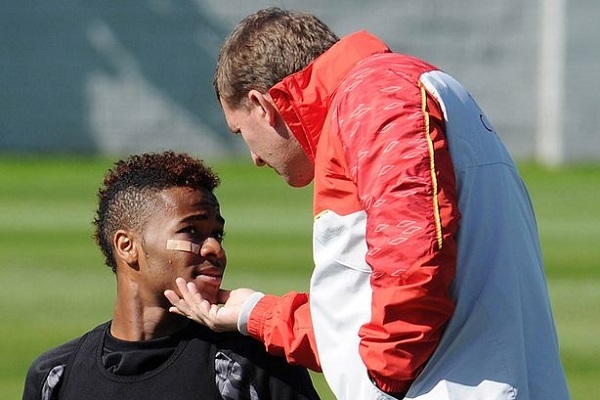 And, to be honest, there’s no better footballing tutor for Ibe than Sterling is right now. As it stands now, it seems that everyone involved in the story has been forced to cut losses. The club does not have their leading player under new contract. The management comes off as a group of increasingly desperate people who are willing to overpay for their leading winger. Brendan Rodgers, who’s been recently trying to use his pupil as a wing-back, admits that he doesn’t know what the future is going to be. Other players wonder what their clubs’ real intentions are. And, finally, Raheem Sterling is receiving a fair amount of hate through social media. Terms like “jumped up little prick”, “greedy little sod” and “money grabbing little sewer s**t” are only the most lenient ones. Since there are still 2 years remaining on the players’ contract and the whole affair is damaging everyone’s reputation, it makes sense to ask: why has it ever leaked to public in the first place? What is the point? Because so far, the only answer is: entertainment. Just two days before Liverpool’s visit at Emirates in London, Arsène Wenger has been tipped to pursue Sterling this summer. Gooner fans are already preparing few chants full of mocking and teasing, but… Is having a mildly interesting banter before the weekend worth all this media coverage? Whatever the answer is, the rest of this season shall be Sterling’s proving ground to justify his contract requirements – or, perhaps, a shop window to display skills for future contractors in case he leaves this summer. Despite LFC’s mediocre record, he still has a lot to play for. But nobody really imagines him elsewhere. “He should stay” – says Paul Scholes. “We need to sign him now.” – claims Steven Gerrard. “The longer he’s without new deal, the worse he’ll look” – Jamie Carragher points out. “Sign your contract. You’re lucky to be there.” – Harry Redknapp urges him. Will the youngster remain under fire for the rest of the season? Let’s leave it to Jamie Carraghers’ voice of the reason: “I regularly signed four-year deals that were ripped up within 18 months (..) when the club felt my performances had improved. That was the way it was done.” Ditto. An improvement. If Sterling experiences it, if he scores on Saturday, if he leads Scousers to a victory in London and to the top four at the end of the season – he shall be forgiven. And if he won’t? Well, in all honesty, The Reds cannot really afford a better winger than the one they have today – unless the dream Marco Reus’ move from Dortmund miraculously happens.